can have a strand ( dozens ) of single hairs bonded ( extended) directly onto customer's own Hair Strand-By-Strand Fusion System. Pre-bonded hair, (1) Stick Hair for Ring System, and (2) Nail Hair. Melting point 100 Degree C.
Our Keratin Bonding lasts for 3 months. 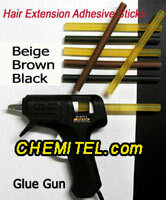 glue sticks in Silicone which melt easily. You can make hair pieces just like our Stick Hair using our Keratin Stick, Gun, and Bulky Hair or Wefted Hair. Besides, you can have our a strand of Stick Hair extended onto own hair by applying Hot melted glue onto own hair and Stick hair, and rolling them to be attached.